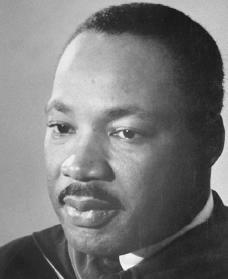 The minister and Nobel Peace Prize winner Martin Luther King Jr. (1929–1968) originated the use of nonviolent methods within the civil rights movement. He was one of the most important African American leaders of his time. Martin Luther King Jr. was born on January 15, 1929, in Atlanta, Georgia. He attended Atlanta public schools and then went on to Morehouse College. After graduation from Morehouse in 1948, King entered Crozer Theological Seminary and graduated in 1951. He then received his doctorate (an advanced degree) in theology (the study of religion) from Boston University in 1955. In Boston King met Coretta Scott, whom he married on June 18, 1953. Four children were born to the couple. In 1954, King became minister of Dexter Avenue Baptist Church in Montgomery, Alabama. In Montgomery, he became active with the National Association for the Advancement of Colored People (NAACP) and the Alabama Council on Human Relations. In December 1955, Rosa Parks (1913–), a black woman, was arrested for violating a segregated seating ordinance (a law enforcing separation between African American and white people) on a public bus in Montgomery. Black citizens were outraged. At the time, many public places, including buses, were segregated. King, along with fellow activists, urged African Americans to boycott the segregated city buses. (In a boycott people refuse to use products and services provided by people, businesses, or organizations until policies and procedures are changed.) From this boycott, the Montgomery Improvement Association (MIA) was formed. The bus boycott lasted more than a year. Finally, the bus company agreed to the protesters demands and ended segregated seating. The U.S. Supreme Court later stated that the bus segregation laws of Montgomery were unconstitutional, or went against the laws of the Constitution. Overnight, Martin Luther King had become a national hero as a leader in the civil rights struggle. The victory had not been easy. As an elected president of the MIA, King's life was in constant danger. His home was bombed, and he and other MIA leaders were constantly threatened, arrested, and jailed. In January 1957 approximately sixty black ministers assembled in Atlanta to form the Southern Christian Leadership Conference (SCLC) to continue the civil rights fight. King was elected president. In February 1958 the SCLC sponsored twenty-one mass meetings in southern cities as part of a "Crusade for Citizenship." The goal was to double the number of black voters in the South. King was now traveling constantly, speaking for "justice" throughout the country. A year later the Kings visited India at the invitation of Prime Minister Jawaharlal Nehru (1889–1964). King had long been interested in nonviolence as practiced by Mahatma Gandhi (1869–1948). Yet, when they returned to the United States, the civil rights struggle had become much more intense. Violent resistance by whites to the nonviolent efforts of black demonstrators filled the newspapers with stories of bloody fights. In February 1960 the "sit-in" movement started in Greensboro, North Carolina. African American students began this nonviolent form of protest by sitting at "white only"
lunch counters in city stores. The movement quickly spread throughout much of the South. On April 15, 1960, the SCLC called a meeting of sit-in leaders to organize the movement. King urged the young people to continue using nonviolent means. Out of this meeting the Student Nonviolent Coordinating Committee (SNCC) emerged. By August 1960 the sit-ins had succeeded in ending segregation at lunch counters in twenty-seven southern cities. In October 1960 the SCLC decided to increase their efforts to get African Americans registered to vote, use boycotts to gain fair employment, and work to end segregation in public places. A popular department store in Atlanta, widely known for its policy of segregation, was the first goal in this renewed effort. When King and seventy-five students entered the store and requested lunch-counter service, he and thirty-six others were arrested. However, Atlanta's mayor worked out a truce and charges were dropped. But King was imprisoned for breaking the terms of his court supervision that resulted from a traffic offense conviction. John F. Kennedy (1917–1963), who at the time was campaigning for the presidency, made a telephone call to Mrs. King, and then worked to get King released. Soon the Congress of Racial Equality (CORE), SCLC, and SNCC joined together to form the Freedom Ride Coordinating Committee with King as chairman. The idea was to "put the sit-ins on the road" by having pairs of black and white volunteers board interstate buses traveling through the South. This would test a new federal law forbidding segregated bus stations. A great deal of violence resulted as resisting whites overturned and burned buses, assaulted the Freedom Riders, and attacked newsmen. Many of the arrested riders chose prison rather than pay fines. However, the protest worked, forcing the Interstate Commerce Commission to enforce laws against segregation. On May 2, 1963, some six thousand school children marched to demonstrate against school segregation. The next day, as volunteers gathered in a church, police blocked the exits, and turned fire hoses and police dogs on the teenage demonstrators. Finally, there was a truce between the civil rights groups and the police. Then, the Ku Klux Klan (KKK; a group that believes the white race is better than all other races) bombed the home of King's brother and the motel where SCLC members were headquartered. Enraged black citizens rioted and Alabama state troopers moved in and set up undeclared martial law, or temporary rule by the military. King and SCLC personnel continued to urge nonviolence but more violence erupted when white racists refused to obey federal school integration laws. The worst came when a bomb thrown into an African American church killed four little girls. The year 1963 continued to be eventful in the struggle for civil rights. In June King led 125,000 people on a "Freedom Walk" in Detroit, Michigan. On August 27, more than 250,000 black and white citizens gathered in Washington, D.C. for a mass civil rights rally. There, King delivered his famous "Let Freedom Ring" address. That same year he was featured as Time magazine's "Man of the Year." In 1964 King and his followers moved on to St. Augustine, Florida, one of America's most segregated cities. After weeks of nonviolent demonstrations and violent counterattacks by whites, a committee was set up to move St. Augustine toward desegregation. A few weeks later, the 1964 Civil Rights Bill, which made discrimination (unequal treatment) based on race illegal, was signed into law by President Lyndon Johnson (1908–1973). In December 1964, King received the Nobel Peace Prize. In 1965 the SCLC concentrated its efforts in Alabama. The first target was Selma, where only a handful of black citizens had been allowed to vote. King urged President Johnson to rush the Voting Rights Act and announced a march from Selma to Montgomery to demonstrate the black people's determination to vote. (The Voting Rights Act, which was passed on August 10, 1965, made it illegal for Southern states to prevent African Americans from voting and registering to vote.) Alabama Governor George Wallace (1919–1998) refused to permit the march, and the five hundred people who gathered to march were beaten by state troopers. Nonetheless, the march continued, and Selma's black citizens were joined by hundreds of black and white protesters from other states. On March 21, 1965, more than ten thousand people followed King from Selma toward Montgomery. Only three hundred were allowed to make the full four-day march, but they were joined by another twenty-five thousand in Montgomery for the final leg to the Capitol to present a petition (a written demand) to Governor Wallace. In 1965 King made a "people-to-people" tour of northern cities. A growing number of black people were becoming aggressive in the struggle for their rights. Their position caused King to take another look at the nonviolent civil rights movement that he had fathered. Although committed to nonviolence and civil rights, he was also troubled about the American involvement in the Vietnam War (1965–73; a war in Vietnam in which American forces supported South Vietnam in their fight against Communist North Vietnam). He soon found himself pushed toward leadership in antiwar groups. In 1967 King began speaking directly against U.S. involvement in the Vietnam War, although many civil rights advocates criticized this position. Around this time, while serving a four-day sentence in Birmingham, which was a result of the 1963 demonstrations, that King and other activists began planning a "Poor People's March." The march was to be held in Washingon, D.C. on April 22, 1968, to bring together the interests of the poor of all races. In February 1968 King led an antiwar rally in Washington, D.C. In March, King went to Memphis, Tennessee, to lead demonstrations against a wide range of complaints, including police brutality and poor school conditions. The march ended in a riot when some frustrated young African Americans began breaking windows, looting, and burning stores. The police reacted quickly and violently. In Memphis on April 3, 1968, King addressed a rally. Speaking of threats on his life, he urged followers to continue the nonviolent struggle no matter what happened to him. The next evening, as King stood on an outside balcony at the Lorraine Motel, he was struck by a rifle bullet. He died a few hours later. In December 1999, a four-acre site near the Lincoln Memorial in Washington, D.C., was approved as the location for a monument to King. The site is near the place where King delivered his "I have a dream" speech in 1963. In September 2000, a design was selected. The monument will be the first to honor an individual African American in the National Mall area. King, Coretta Scott. My Life with Martin Luther King, Jr. New York: Holt, Rinehart and Winston, 1969. King, Coretta Scott, ed. The Words of Martin Luther King Jr. New York: Newmarket Press, 1983. King, Martin Luther, Jr. The Autobiography of Martin Luther King Jr. Edited by Clayborne Carson. New York: Intellectual Properties Management, 1998. Millender, Dharathula H. Martin Luther King, Jr.: Young Man with a Dream. Indianapolis: Bobbs-Merrill, 1983.
he was a great and important man to our nation. he ment alot to everyone.